I could not have expressed my gratitude any better than Mr. Meek did in the above statement. This blog will serve as my sort of “giving back”, as I hope many of my Futurist friends as well as fellow Preterist brethren will read this blog and Mr. Meek’s book and “see clearly”. it is an earnest plea because as David Green said in the beginning of Charles Meek’s book – “The last days are approaching- the last days of futurism, that is. Out of the dying and conflicting ism’s of the tradition of futurism is arising the FAITH-CONFIRMING truth of FULL PRETERISM. it’s ascent has been slow, but steady and sure”. I must say reading the ‘Forward’ to ‘Christian Hope through Fulfilled Eschatology’ was one of the most encouraging things I have read it a while. Packed with what I would call “THE POWER OF PRETERISM”. A must read for sure. This isn’t necessarily intended to be a “book review”, but I imagine many may care for my thoughts. 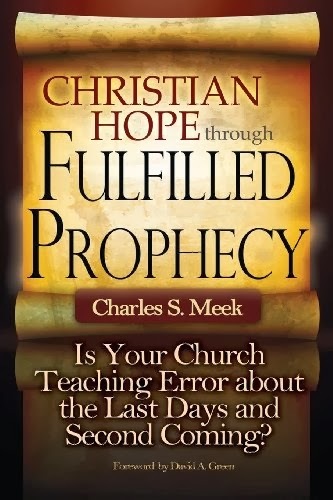 In writing ‘Christian Hope through Fulfilled Prophecy’, Mr. Meek has provided a humble, simple, and full of answers explanation of Full Preterism. I will admit there were areas that I may “agree to disagree” (as you will see through this blog), but overall the intellectual honestly that was put forth by Mr. Meek was astounding. So let’s jump right into it….. What do YOU know about the end times? Are you views based on Scripture of maybe what you have been taught? Have you taken the time to examine things for yourself? This is so important because if you would have talked to me about 6 years ago I had an entirely different view of Scripture, of the “end times” and of the gospel message. I can assure you as I have set out to “prove all things (1 Thessalonians 5:21)” my faith has been challenged and strengthened. I can truthfully and reasonably tell you my Biblical hope today and know beyond any reasonable doubt that I am standing on a firm foundation. I’ll even debate it! Sadly, many Christians have a reluctance to reexamine their views. Many so-called Christians are content with reinforcing erroneous teachings just to “go along with the crowd”. That’s a sad position for a Believer to be in. This is equivalent to the “ecclesiastical tyranny” and “crowd psychology” that Charles Meek mentioned in his book. The question every Christian must both ask themself and answer is: “Are you ready to listen to what God’s Word teaches?”. “Christian Hope through Fulfilled Prophecy” starts at a great point- in 1st century Jerusalem. The failure of modern Christians to understand the Scriptures in their historical context has by and large led to a confused gospel message. I have reiterated again and again as I preach before The Blue Point Bible Church (http://www.bluepointbiblechurch.org) that we MUST understand the story of ancient Israel. As a Preterist many of my Facebook friends have seen my continual harping on the importance of AD 70. “When Israel ceased to be a nation and the temple was demolished in AD 70, these events fulfilled what Jesus said would happen in His generation (Matthew 24:2; Mark 13:2; Luke 19;44; Luke 21:6)”. Understanding these events, what is called the Roman-Jewish War, enables us to understand “redemptive history”. Yes, YOUR REDEMPTION! Many Christians will continually speak about the importance of the death, burial, and resurrection of Jesus Christ but sadly exclude the destruction of the temple in AD 70. “While the death and resurrection of Jesus Christ ushered in the New Covenant order, it was the destruction of the temple (which ended the system of sacrifices for sin nearly forty years later) that formerly ushered out the Old Covenant order”. Do you understand the teachings and implication of Full Preterism? If not, there are various websites, articles, sermons that you can go to. A site that I personally run and am developing is http://www.christhascome.org . Another great resource is http://www.thefulfilledconnection.com. “This problem is not trivial. Everything we know about Jesus and His teachings comes from the Bible. It is not our prerogative as Christians to ignore the Biblical evidence , and invent a Jesus to suit ourselves. That would be idolatry. We cannot legitamately manufacture our hope from a false set of assumptions; we are limited to understanding Jesus and His teachings as presented in the Bible. Just as importantly, we must not present an unreliable Jesus to the world”. Recently at THE POWER OF PRETERISM CONFERENCE that was held at The Blue Point Bible Church in Blue Point, New York – Bible teacher Joe Daniels, Apostle Johnny Ova, Dr. Don K. Preston, and myself all made the point that Preterism advances the teachings of Jesus and to say otherwise diminishes the Biblical hope, the reliability of Jesus’ teachings, the Deity of Christ, and the apologetics of Christianity. Many a times I am asked- ‘Why don’t people plain and simply see the truth of Full Preterism?’. I believe the need for Biblical education in regards to fulfillment is in order. Not only in matters pertaining to eschatological events but instead in regards to Biblical History, Church History, Biblical Hebrew & Greek, Soteriology, Christology, Ministry Leadership, and Life Application/ Discipleship. I endeavor to start a basic style seminary in the near future- Learning Institute of Fulfilled Eschatology (L.I.F.E.) with a creative focus on development, reformation and networking. Charles Meeks provides an introduction in hemeneutics in Chapter 2 of his book. “We have built doctrines by picking and choosing the passages that fit our ideas and have ignored those passages that challenge us. We are really not interested in truth if it upsets our applecart. This has led to a shallow, lazy, distorted, and divisive Christianity”. Mr. Meek is speaking in reference to “our extra Biblical presuppositions”, examining “wooden literalism” with a game of “twenty questions”, and provides an explanation of Principles of Biblical Interpretation. “Eschatology is not about the end of the “world”, but rather its a rebirth instituted by Jesus in the New Covenant order”. “We are of the studied opinion that the “Second Coming” of Christ was not to be a physical body appearance on earth, but rather a coming in judgment against the unbelieving Jews who perverted God’s commandments and rejected Jesus and His Church”. Also the point could be proven that, “…many Christians also think that the tribulation will be a global event. But notice that Jesus said that one could avoid the tribulation by fleeing to the mountains (Luke 21:21)”. “Peter’s prophecy in 2 Peter 3 was a reiteration of Isaiah 24. In that chapter, Isaiah spoke of a time when the sun and the moon (the heavens) would be confounded and ashamed (Isaiah 24:23) and when the earth would be burnded, broken down, dissolved, and would fade away (Isaiah 24:4-6, 19-20). Isaiah was speaking of the destruction of Jerusalem (Isaiah 24:12)”. Sadly many within the Church have clung to a neo-Gnostic understanding of what the gospel message is about (mislabeling the ‘elements’ coming under judgment- Romans chapter 8 & 2 Peter 3:10). Quite frankly the message is about freedom from the Old Covenant- described as “the law of sin and death (Romans chapter 8). Understanding this freedom by reading through Galatians chapters 3-5 and Colossians chapter 2. A great read concerning the confusion regarding the transition of Covenants and ‘the Coming of the Lord” is ‘Behind the Veil of Moses’ by Brian Martin. In the book, Mr. Martin makes a great case for the fact that the confusion regarding the “2nd Coming” of Christ is equivalent to the confusion regarding the first coming. The Jews rejected Christ’s coming because He did not come according to their expectations, the same with John the Baptist as “the Elijah to come”. Sadly today many will provide gimmicks, gaps, and so forth to defend their erroneous views. In his book, Charles Meek deals with the way those who adhere to “partial fulfillment” – “divide the text”, “pick and choose”, fabricate a foreign concept of “types and shadows”, “separate questions”, and completely avoid “audience relevance”. “It is impossible to read the Olivet Discourse and fail to perceive its distinct reference to the period of our Lord’s crucifixion and the destruction of Jerusalem. Every word is spoken to the disciples, and to them alone. To imagine that the “you” in this address applies, not to the disciples to whom Christ was speaking, but to some unknown and yet non-existent persons in a far distant age, is so preposterous a supposition as to not deserve serious notice”. With that in mind…Go and read Matthew 16:25-28. What does the text imply? Do you believe in the words of Jesus Christ? The humility expressed through Christian Hope through Fulfilled Prophecy is astounding. Mr. Meek provides information on the millennium, the new heavens and new earth, resurrection, among other things. “Jerusalem was judged in the first century for her historic crimes (See, Matthew chapter 23). There is no reason to believe she (harlot Jerusalem) will never be judged again for those crimes”. Also, many critics of Full Preterism constantly refer to “the resurrection of the dead” and ask for a “better explanation” than that which is being given. This has been done again and again by many leaders within Full Preterism. I would refer people to read through Dr. Don K. Preston’s stuff…. also, soon enough I will have the video files from THE POWER OF PRETERISM CONFERENCE wherein Dr.
Preston presented an awesome teaching regarding the resurrection. “Futurists often argue that because Christ rose physically, so must we. That notion is as false as saying that because Christ was literally crucified, we must also be literally crucified (Galatians 2:20) in order to have eternal life”. The proper understanding of “…resurrection is recovery of relational death between man and God that stood since the Garden of Eden (Genesis 3:7, 15; 2 Corinthians 5:1-3)”. I did notice that Mr. Meek put “bodies” in plural form in many places that I would advocate a necessary ‘corporate’ understanding. Within Full Preterism there is the CBV (Corporate Body View) and IBD (Individual Body at Death view) debate and I have failed to see a proper explanation of IBD. It seems that Mr. Meek advocates a merger of sorts that I have in the past spoke about with other leaders within Full Preterism. Honestly, I don’t see it. Mr. Meek mentioned you can find this individual body reference throughout Scripture. Please provide. “At some point Christ must have changed- probably at the ascension. After His ascension, Jesus appeared to Paul on the road to Damascus in a manner that Paul could see a light and hear the voice of Jesus , but neither he nor his companions actually saw Jesus in physical form (Acts 9:3-9; Acts 22:6-11; Acts 26:12-19 cf. John 17:5; Hebrews 5:7)”. “There is evidence that the concept of the immortality of the soul, as understood by many Christians, my be more from Greek thought than from the Bible”. To me it’s rather simple. In John 3:16, “eternal life” is offered to those who believe in Jesus Christ in contrast to “perish” not some odd view of eternal torment. This postulates the view of Conditional Immortality. Think about it….if someone dies and goes to hell for eternity- doesn’t that mean they are living eternally in hell? “Some Christian scholars are convinced from a comprehensive analysis of the Bible that hell is not, in fact, a place of eternal conscious punishment as is the standard view. Gehenna, the Greek word rendered ‘hell’ in English, was an actual place outside of Jerusalem where waste was deposited and burned. So, some argue that Jesus used gehenna/hell as a metaphor for the total destruction of annihilation of the damned, rather than a place of eternal conscious punishment”. “Jesus appeared at His First Advent to put away/ remove sin (Hebrews 9:26 cf. Daniel 9:24-27; Matthew 1:21; John 1:29; Acts 5:31; Romans 6:1-14; Colossians 1:22; Titus 2:14; Hebrews 1:3; 1 Peter 2:24; 1 John 3:5; Revelation 1:5), and to destroy the works of the devil (1 John 3:8). DID JESUS FAIL?”. WHY HAS THE CHURCH FAILED TO CORRECT THIS ERROR? “We can track the various eschatological views down through the ages; unlike other doctrinal issues we see no formal discussions of eschatology within the Church”. “Preterists are at the forefront today of the call for a serious and open debate on the Biblical “last things”. “If you believe what you like in the gospels, and reject what you don’t like, it is not the gospel that you believe, but yourself”. Before you go over to http://www.ChristHASCome.org, here are some basic details about Full Preterism. “We strongly suggest that any eschatology that denies a plain literal interpretation of the New Testament time-texts, has adopted an overly elastic and, frankly, unscriptural position that damages the Bible’s integrity”. “The good news is that the days are over for even brilliant scholars to to easily escape legitamate challenges; the pace of modern communications is turning the tide toward truly open debate. The resultis the SURGING PRETERIST CHALLENGE TO ESCHATOLOGY”. “Covenant eschatology solidifies our understanding of the gospel and unifies the message of Scripture. The preterist view reveals the immensity of Christ’s victory”. “And while it is the minority view in the Church today, it seems to be the fastest growing view”. “…preterist eschatology is optimistic, beautifully consistent, and faithful to Scripture”. “Preterism is a theology that can bring answers for those who are sick, dying, struggling with faith, oppressed, addicted , and even living in sin. In fact preterism provides the only real answer to these problems since it is the only theology that addresses the whole of Scripture, believing the Word of God for what it actually says instead of for what men have claimed it has said in the past…True faith is realizing the fulfilled hope we have to live in today, in this moment, instead of some escape clause for the future”. I can promise you that when you consider the Biblical evidence for the truth of Full Preterism with ‘intellectual honesty’, you will see that the belief in a yet future ‘second coming’ of Jesus is a serious error and makes as much sense as saying- “Don’t confuse me with the facts”. “The modern church is an embarrasment to Biblical Christianity, and is too often a stumbling block to seekers. These things must change, and perhaps are beginning to change. We sense that young people especially, at least those that have not left the church for good and still give a whit, are fed up with questionable doctrines and practices in the church”. “Who has a heart hardened by biases and preconceptions, Lord? Is it I? Show me the blind spot in my own eye, Lord! Give me the fortitude to deal with error that I might hold. Give me a passion for Biblical Truth. May I not be satisfied with the status quo. And give me the courage to speak up, even among my peers”. Amen.